We were pretty nervous about moving into this big old farmhouse, particularly heating it through our first Minnesota winter. Lucky us, our electricity company subsidizes the cost of performing an energy audit. It took me all of two seconds to sign up for one. 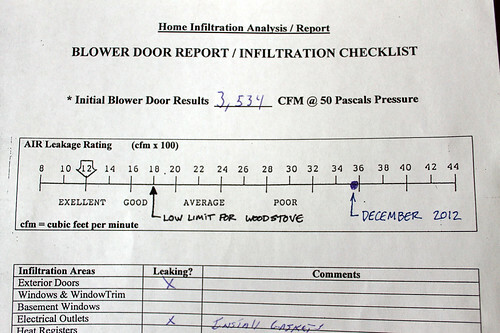 On Friday, the energy auditor showed up with his blower door and got to work. It’s not great, but I was bracing myself for worse results. There were some big surprises in the energy auditors report too. For example, the part of the house with the biggest air/energy leaks was not the old (relatively uninsulated) lath-and-plaster original part of the house, but the circa 1970’s addition. 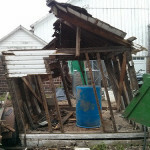 The primary culprit is the uninsulated crawlspace beneath the addition. 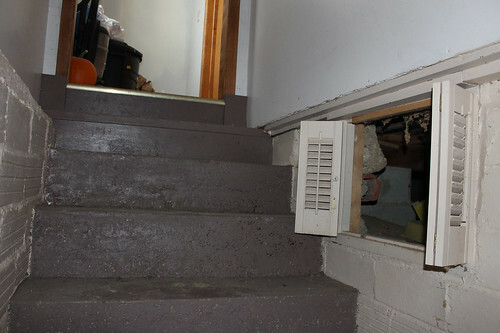 With the blower door going, there was quite a gust coming from the crawlspace access in the basement stairwell. 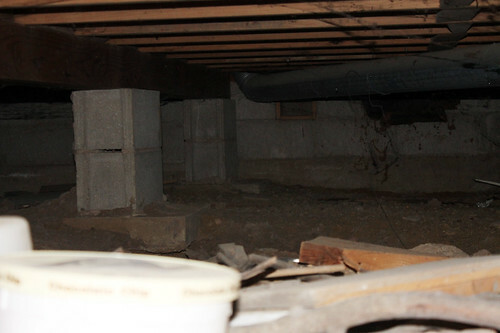 While the walls are well insulated, the sill plate and foundation walls in the crawlspace are without a stitch of insulation. 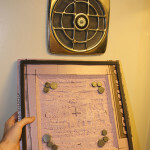 There’s also the matter of the 6″x6″ hole that opens to the great outdoors (now blocked off with foam board). So I’m supposed to crawl back in there sometime, roll out plastic on the ground, glue rigid foam-board to the wall (enough to get R-10) and generally caulk and insulate the heck out of the sill plate. What fun. It’s a cheap fix, but it’ll mean working in crawlspace for hours on end. 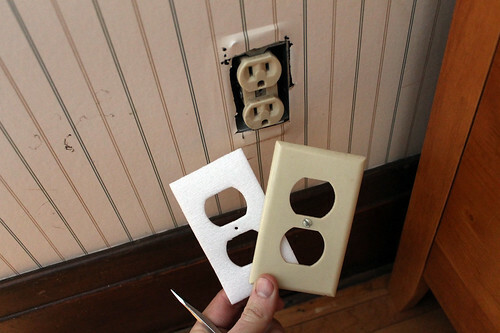 An easier task on the list is to put those little foam gaskets on every outlet and light-switch in an outside wall. It’s supposed to be good for a 100cfm reduction in air infiltration. Consider it done. 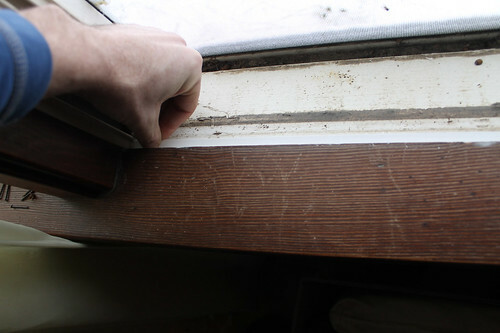 While the windows were generally in good shape, being new as of 1997, and dual-pane at that. But a few of them had a little leakage at the lower sill, add a new weatherstrip and they’re much better. 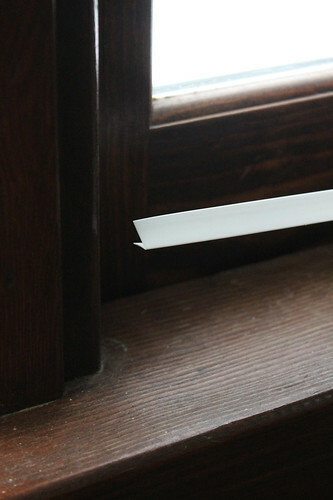 The energy auditor was very specific that any weatherstripping should be the V-shaped stuff. The 3M stuff is apparently the bees knees, but being unable to find any, I went with whatever brand they had. Now I’ve got to fabricate a few insulated, gasketed covers for things like the attic access, the crawlspace access, and the bathroom vent fan. More on that later. Sure, this house isn’t my uber-efficient off-grid dream home, but it’s not as bad as I thought. With a little work this place can be brought down to below-average energy consumption, maybe even go carbon neutral someday. 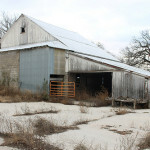 Plus there’s just something to be said for a cool old house like this one. It reminds me of the house I grew up in, which is not surprising given that it was also an old 1890’s farmhouse. 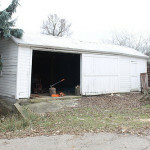 I think I’ll have to have the energy auditor come back out in a few years to see what kind of improvement we can make.